Listen to your baby’s heart beat from 10 weeks! Order by 12 Midday (AEST) for same day dispatch via Express Post Free! An additional payment of $14 is charged upon sign up to cover return freight. Compare 2Mhz Vs 3Mhz Doppler Probe – Click Here. With FREE next business day delivery (conditions apply), you can use the Belly Beat Doppler to pick up your baby’s heartbeat from as early as 10-12 weeks. Each Doppler comes with an LCD Fetal Heart Rate Display, batteries, gel, instructions, tips and a carry case. If you run out of ultrasound gel you can use any water-based lubricant. These can be purchased in your local supermarket or chemist. The minimum hire period is one month. There is no maximum hire period however if you feel you would like to hire a unit for an extended period of time you might like to look at purchasing the unit outright. 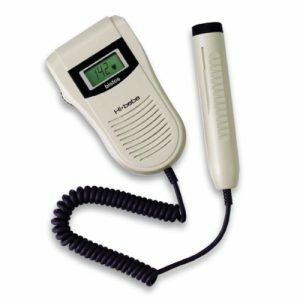 Will my hire fees apply if I decide to buy the Doppler? All hire fees paid to date will be taken off the purchase price of the Doppler should you decide to purchase it. By hiring a Belly Beat Doppler you authorise PayPal to charge the monthly hire fee and the one-off non-refundable return postage fee to your nominated credit card or bank account. This first payment, and subsequent payments, will be charged to your account on the date the order was placed. The hire fee will be charged until the unit is returned to Belly Beat Doppler Hire or the Doppler is purchased and paid for in full. Your hire date does not start until the Doppler is dispatched. Belly Beat Doppler Hire understands the need for discretion. The parcel does not have the business name specified anywhere to ensure your privacy. Once you have placed your order we will contact you to let you know we are out of stock and provide you with an estimated wait time. At that time you can cancel your order or choose to wait for a Doppler to become available. Your hire period will not start until the Doppler is dispatched. What do I need to do at the end of my hire? Please click here for instructions on what to do with the Doppler at the end of your hire. Once the Doppler has been delivered you have 5 working days in which you can email or telephone us to cancel the hire. If you do cancel the hire we will refund you the monthly hire fee but the delivery/return courier fee is non-refundable. Goods will normally be delivered within 2 working days but if your goods are not dispatched and received by 30 days you will receive a full refund of your first month’s hire and courier fee. If we are out of stock we aim to have the Doppler delivered within 5 working days but we will make you aware of the delay at the time you place the order and you can cancel your order immediately if you wish. The Doppler remains the property of Belly Beat at all times except when the Doppler is purchased in full. You are responsible for the care of the Doppler until the unit has been returned to Belly Beat. If the Doppler is lost, stolen or destroyed during your hire you are responsible to pay for the Doppler in full. The gel is yours to keep and need not be returned but the batteries and original packaging must be returned with the Doppler. Please click here for details on returning your Doppler. The Doppler must be returned in the same condition as it was received. A Doppler returned requiring repair will be assessed and if the fault is not covered by the warranty we may bill you for the repair if the damage is due to misuse or mistreatment of the Doppler. If you decide to purchase the Doppler the warranty will be back dated to the start of the hire. The warranty is for one year. The Belly Beat Doppler will perform to standard specifications. We will replace any unit that fails during the one year warranty period. However, if upon inspection of the Doppler it is determined that the Doppler was altered or repaired by an unauthorised technician, or the Doppler was damaged by misuse, neglect or accident, then you assume full liability for replacement or repair costs. If you have not contacted us by email or telephone and/or returned the Doppler within 3 business days of the end of the current month’s hire, you will be billed for each subsequent month’s hire until the Doppler is returned or paid for in full. When the Doppler has been returned in good working condition we will cancel the monthly charges. Should you be billed after this time we will credit you for the amount deducted in error. It is very important to note that while the Hi-Bebe Doppler is a medical grade instrument, Belly Beat Doppler Hire do not intend for the Doppler to be used in any way for diagnostic or other medical purposes unless the purchase has been made by a licensed medical practitioner. The device should not be used as a substitute for or replacement of regular recommended antenatal care. Always seek professional, medical advice should you have any concerns during your pregnancy as just listening to your baby’s heartbeat doesn’t assure you of your baby’s well being. By hiring a Doppler from Belly Beat Doppler Hire you agree to release, indemnify and hold harmless Belly Beat Doppler Hire and all associated persons from all liability arising from or relating to the use of the Doppler and associated equipment either hired or purchased from Belly Beat. By hiring a Doppler from Belly Beat, you accept and agree to these terms and conditions.